← The Research Says: Bridge This Gap! 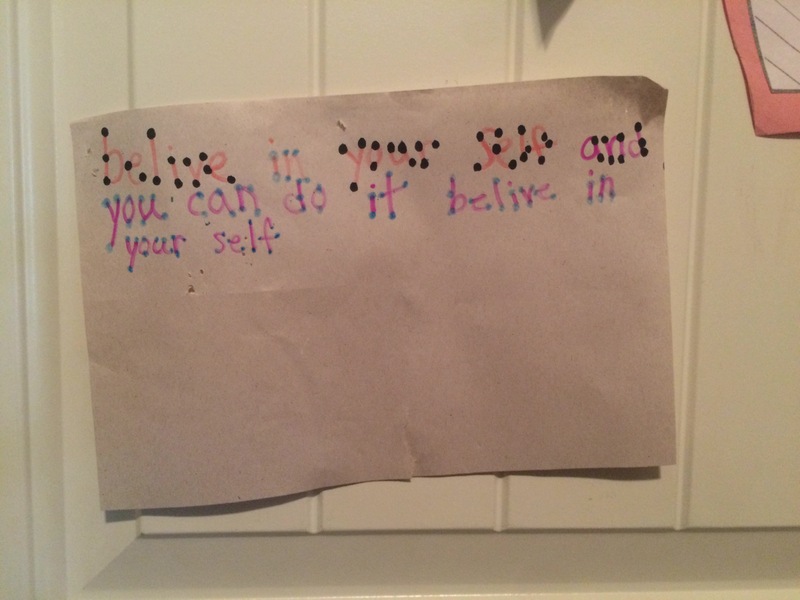 This is taped on the bedroom door of my eight year old daughter. I think that these are words to live by. Why? Well – if you don’t believe in yourself you may not take any risks. If you don’t take any risks, then you really haven’t done anything new. If you haven’t done anything new, then you are doing the same old thing. If you are doing the same old thing, then how are you preparing students for a future yet to be defined? It’s also important for us teacher types to remember that we may be the person that sparks this self belief. The “my teacher thought I could so I did” mantra…You have to believe in your students and colleagues and build them up. Encourage both your students and peers to try incredible, crazy ideas. Be a sounding board when they run into the proverbial wall. Offer support when the the cool idea doesn’t work out the first time (remember – failure is ok). As we all experience those failures – the belief that we have in ourselves is so vital. Do we just give up and quit? Do we make some tweaks and try again? Do we learn from the experience and grow as an educator or learner? What are you teaching your students? Are you helping them believe in themselves? Are you helping your fellow educators believe in themselves? Are you a role model for believing in yourself? You are brilliant people – share your brilliance with those you teach and work with. Make the most of everyday and never, ever quit believing in yourself! One Response to "Believe in Yourself"
There is only one reason you can’t do something – you CHOOSE not to try! Will we always complete our efforts? Of course not – if we are accepting risk being involved… But we can learn from the failures that will happen – as you so correctly point out!!! Love your ‘if-then’ sequence!!! The other message is that we educators must encourage this as early as possible AND often. And we need to facilitate the effective learning skills development! Why??? Because it is a fact that we cannot know what each student will face in their lifetimes! They must be comfortable with effective self-learning, taking risks, and dealing with failure – all will be absolutely needed!! !